Welcome to the site of Dr Stephen Kerr. Dr Kerr has been looking after the medical needs of Anglophones here in Florence since 1998. 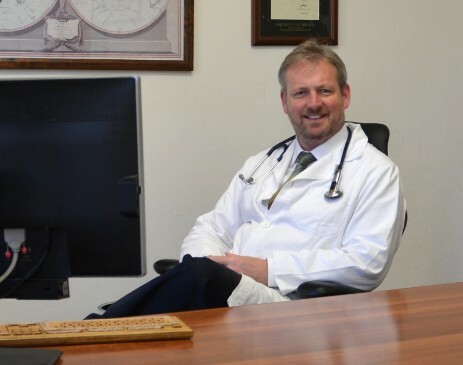 He is a family physician / general practitioner, while trained in London, has built a practice for ex-pats, tourists and study-abroad students here in Florence. The office is located right in the historic centre of Florence just a few minutes walk north of the Ponte Vecchio and just south of Piazza Repubblica. The official address is Piazza Mercato Nuovo 1 [studio medico del cinghiale]. The locals refer to this piazza as La Loggia del Porcellino. It has a small leather market and on the south side is the famous statue of the bronze boar. The map to the left shows the exact position on the piazza (east side of the square). However if you enter the address (rather than this website) into google maps it puts the marker onto the right (west) side of the square about 200ft away. Phoning and having a fixed time is preferable. Both numbers connect directly to the doc so no problems communicating. Also, for routine calls, please call between 8am and 8pm.